A strong and effective marketing campaign is something that all of the best restaurants and bars have in common. This does not only relate to drumming up interest on the Internet and via print marketing materials, but is also relates to standing out from other restaurants in the area due to their window displays and in-store promotions. With that being said, read on to discover some top tips for identifying the best restaurant bar café displays. Special deals and promotions – The best restaurant, bar, and café displays are those that feature special offers and discounts. After all, who doesn’t like a bargain? If you run a happy hour at your bar, or you offer a special set menu, such as two courses for ‘x’ amount, then you should advertise this in your window display. This is the sort of thing that is guaranteed to entice people that pass by your restaurant. Moreover, more and more food and drink establishments are offering special offers, and if you don’t do so, you are only going to get left behind the competition. Q code posters – Have you considered a Q code poster in your window? If you are unfamiliar with these posters, they basically feature a code that can be scanned by smartphones and tablets. The Q code will then connect the individual who scanned it to your website or one of your social media pages. This is a great way to boost your online presence. 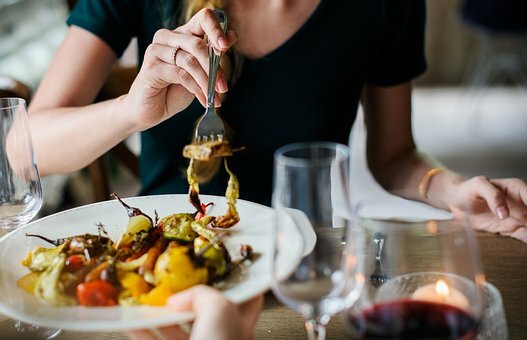 A lot of people like to post pictures of their meals onto social media, so offering them an easy way to connect can be beneficial to you. Regular updates – The best restaurants and bars will update their window displays and such like on a regular basis. There will always be no promotions and deals for people to take advantage of. If you simply showcase the same posters in your window for weeks and months on end, people who pass by will start to lose interest, and it can even have a negative impact on your brand image. LED outside menu – This is one of the basic and most important tips when it comes to advertising for restaurants, bars, and cafes. However, it is something that a lot of business owners still overlook. Most people want to know what food is available and how much it costs before they go into an establishment, and the same goes for a cocktail bar. This is why you need to have an outside menu that is well lit with LED. The way you run your restaurant is important, and there are lots of great pieces of advice online about this. You can read these 15 restaurant management tips to improve the way you work for some great advice. You also need to think about the setting you create. Cutlery is often overlooked in this regard. Of course, the main purpose of catering crockery is for practical reasons. However when you are spending your cash on supplies you may as well make sure they look good too – especially when they are going to be visible to your customers. There is an array of different crockery options for you to choose from. Therefore, you won’t be short of choice and you should definitely be able to find crockery to suit your taste and the style of your restaurant. Whether you go for something classic and minimalistic or you go for something colourful and more elaborate; the choice is yours, yet make your decision wisely. Simple and classic designs are always highly recommended because they tend to be suited to everyone’s taste and they will never go out of fashion either. So you need not worry about having a revamp of your crockery in the near future. Some of the most classic and simplistic styles of catering crockery include white porcelain crockery. The great thing about this option too is the fact that white goes with any colour scheme or theme of restaurant and therefore you won’t have to worry about it clashing with the decor you already have in place. Nonetheless, if you want to go for something different from the norm then incorporating colour is a great way of doing so. Vivid colours can make a great style statement. You can also use colour psychology to your advantage too. For instance, colours such as red, yellow, and orange actually have a stimulating effect on one’s appetite. On the other hand, people who eat off of dark plates tend to eat less in comparison to the likes of red plates whereby people eat more. Think about this carefully and you can use it to great effect. Follow these two tips and you can move your restaurant forward!